stafsurv were instructed by D. Wardle Plant to assist in the planning of the phased extraction of coal from the former yard of George Stephenson & Co. (Better known for the The Stephenson’s Rocket Locomotive) at Clay Cross in Derbyshire. Our client’s interest in the site was at tender stage so it was critical that the phasing and calculation of volumes was precise and realistic. 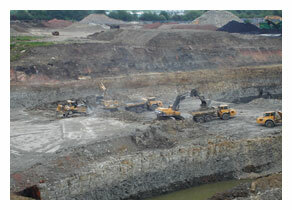 The calculation to quantify the volume of overburden which had to be stockpiled until sufficient coal was exposed & removed before backfilling could take place was crucial to the sites success as the double handling element could run into hundreds of thousands of metres cubed. The final report contained a full set of phasing drawings showing extraction, backfilling and haul routes together with schedules of quantites and phased volumes. D. Warldle Plant were successful in their bid for the works and are now progressing well with this 2.5Mm3 earthworks project. We are also still involved in the project carrying out the month end surveys and mineral surveys for both volumetric purposes and as a permanent record for the Coal Authority. © 2014 South Staffs Surveys. All rights reserved.